Editor's note: This photo essay was originally published on Sightline.org here. Find more of Anna Fahey's writing on Sightline's blog. My daughter will turn three this year, and we just enrolled her in preschool! With all our childcare at home to date, we’ve been lucky to avoid lots of extra running around with the kid. So, no sooner had we signed little Audrey up for preschool than we began to fret about the logistics of getting her to and fro — without royally complicating our lives. 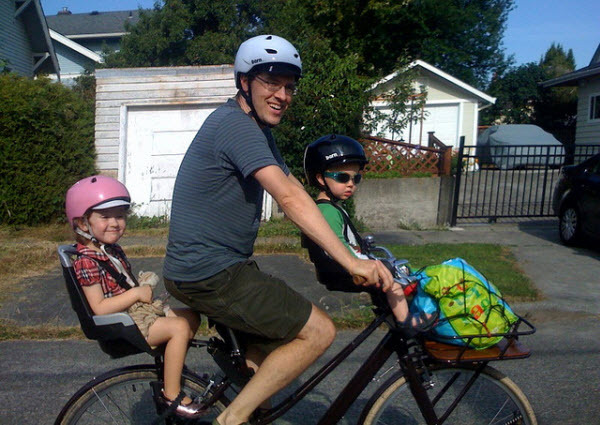 I heard two things most often from biking families. First, they want to raise their kids outside of the prevailing car-only culture. Don’t get me wrong; these aren’t anti-car extremists. Not in the least! All these families own cars — and use them. But they feel it’s important for their kids to grow up knowing there are healthy, enjoyable, convenient, and environmentally-friendly ways to get around without automatically defaulting to the car. We bike twelve months a year, rain or shine. The most important part about getting to school this way is that our kids will grow up thinking that biking is a normal human activity, not something we do only during play time, or only on weekends. That’s how I grew up, and I’ve been riding ever since. Long distance ride with a three year-old! I bike with my two year old a lot. 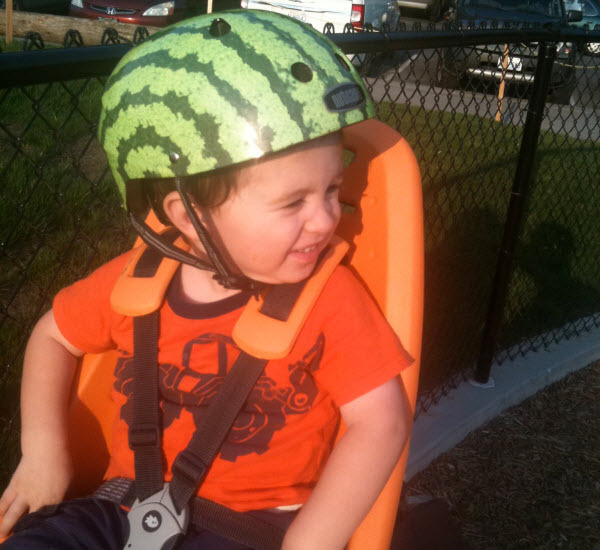 We started when he was about 10 months old, and we use an I-bert, which is one of those green seats that goes on the front of your bike. He loves it, and chatters and points at stuff constantly. 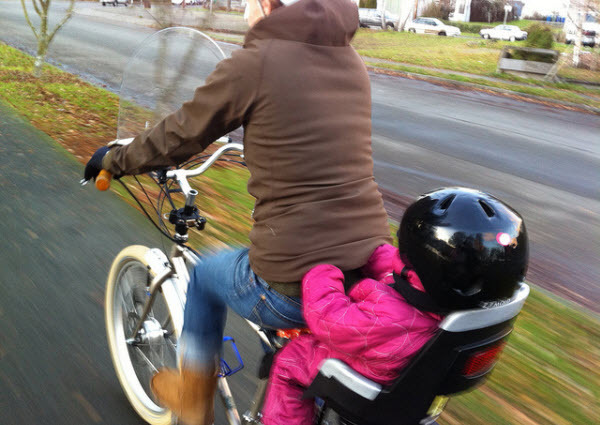 Mom at the helm, kid in the rear rack bicycle seat. Think about it: Unlike traveling by car, when you’re on your bike you can easily stop and smell the roses (literally! )—or stop at a park, or a neighbor’s garden for a chat, or a food stand for a bite. Even when you’re zooming along you’re still going at a pace where you can take in sights and smells. 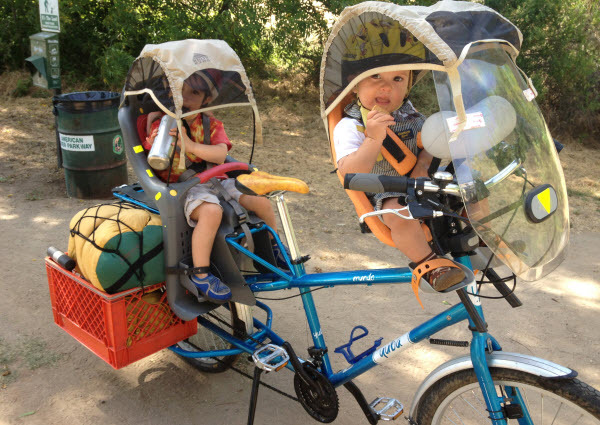 Photo: Madi Carlson and sons Brandt (5 years old) and Rijder (2 years old). Riding in the snow! Used with family’s permission. There are some fancy set-ups to drool over, however. Sun and rain shields anyone? 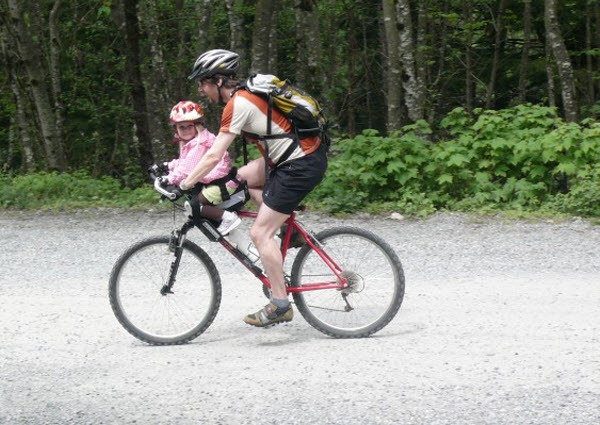 A set-up where you can carry kids and stuff is essential for just about any biking mom or dad though. Every parent knows that you don’t go anywhere with small children without plenty of provisions. And if you want to do your grocery shopping and other errands with kids in tow, a tough bike, solid wheels, and extra cargo space becomes even more important. 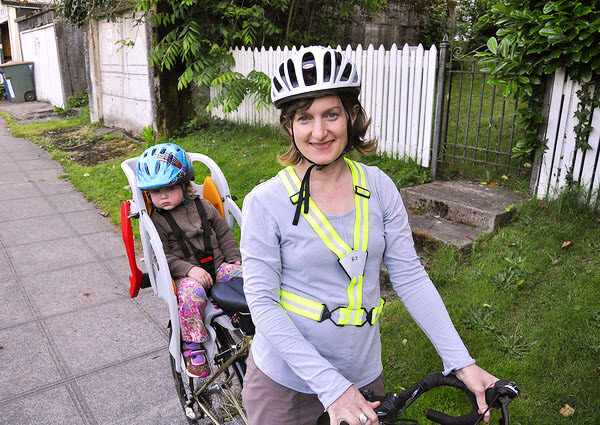 Obviously, parents who bike with kids in tow need to be even more cautious than when they ride solo — your reflexes are the same but you just aren’t as agile. The bike rides differently when you’re hauling a trailer or balancing a 35 pound kid on the rear rack or handle bars. Following the rules of the road, taking the route with a bike lane (or path), avoiding rush hour and riding quieter streets seem sensible to me — especially as a newbie. Making sure your gear is intact and installed to the exact manufacturer’s specifications is a must. A word to the wise: Dress in bright colors, use lights and reflectors, flags and whatever else you can to be highly visible. A couple parents told me that car drivers are more cautious when they see that you have a kid on board. Bike-to-school programs address large global issues from climate change to childhood obesity. With each group ride, children are empowered to take charge of their own transportation—they learn to be more confident cyclists, and that they don’t have to depend on cars to get around. They (and their parents) learn which of their classmates live nearby, making it easier to build networks for friendship and support. 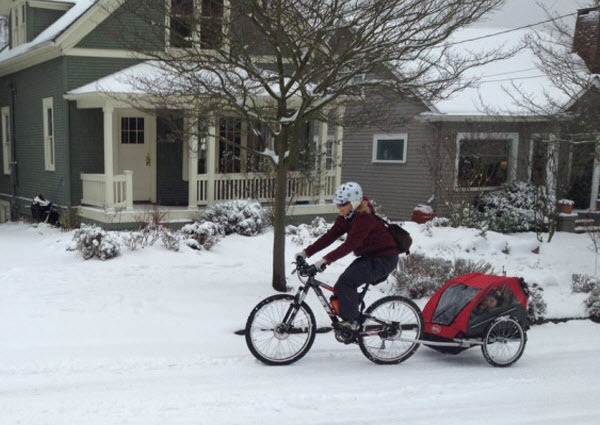 And there’s a burgeoning bike train movement at several Seattle schools. Photo credit: Use with family's permission. As one mom pointed out to me, “there are lots of resources and a great community in Seattle for those who want to ride bikes with children, from the Seward Park Bike Sundays to local bloggers and organized kid rides you will find the support you want!” She’s right. 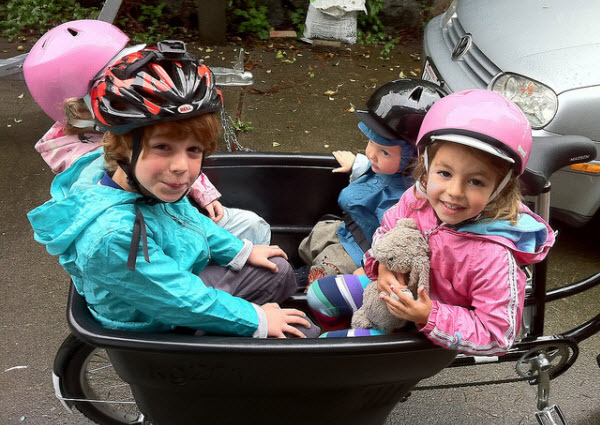 I unwittingly entered a welcoming, helpful, and enthusiastic world of bike parents when I started researching this post. Biking with baby in Walla Walla. There’s also Seattle’s bike-blogger and bike-kid-commuter, Davey Oil. He also works at Bike Works, a nonprofit bike shop and community-building organization that’s beginning to offer a whole suite of programs designed to encourage parents to go by bike. (Stay tuned). 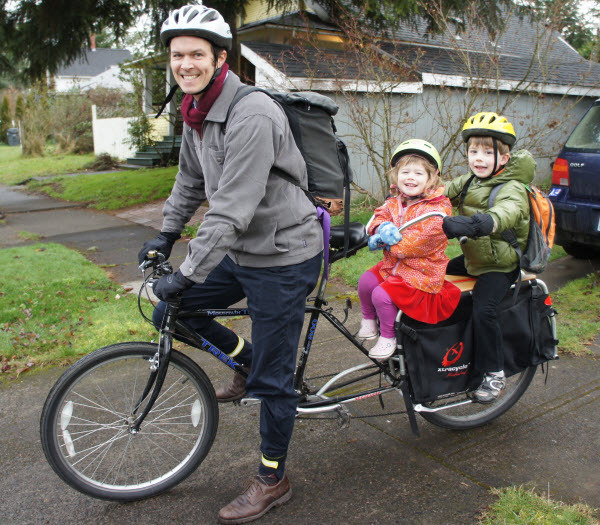 There are community rides as well, like the monthly, Kidical Mass — a “fun, safe, easy-going, and law-abiding family bike ride for kids of all ages.” Apparently it started in 2008 in Eugene, Oregon, and has since spread to other places (including Seattle). 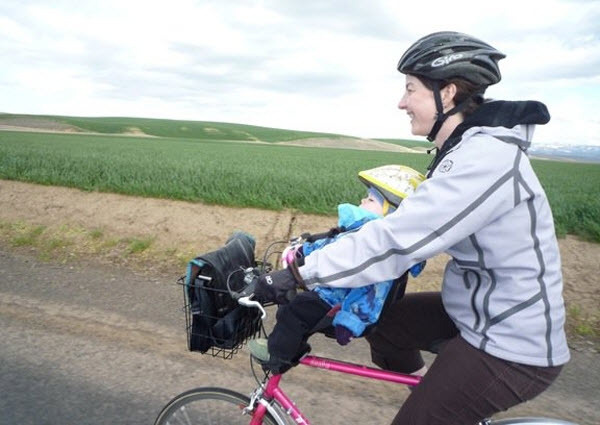 Photo credit: Biking with baby in Walla Walla. Used with family's permission. 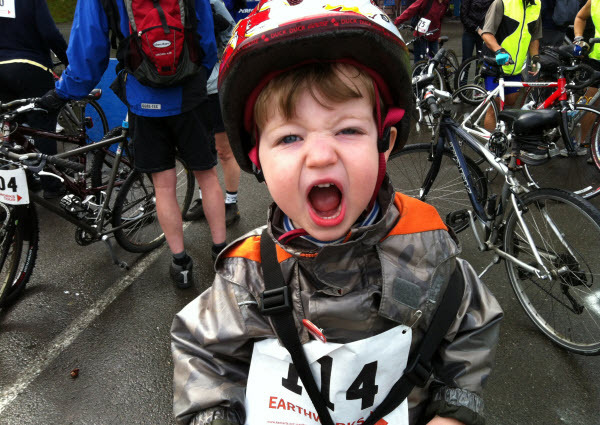 Photo credit: A very happy child cyclist at Earthworks tour ride in Kent. Used with family's permission. Photo: The author and Audrey on our first ride. Photo credit: Gustav Moore. Anna Fahey is senior communications strategist for Sightline Insitute, an independent, Seattle-based nonprofit research and communications center, where she oversees opinion research and distills best messaging practices on tricky topics like climate change and government. Find more of Fahey's writing on Sightline's blog, where a version of this post originally appeared. Prior to Sightline, Fahey received her MA in political communication from the University of Washington.